My first GIVEAWAY! Win a whole bunch of my favourite things! - Sugar, Darling? My first GIVEAWAY! 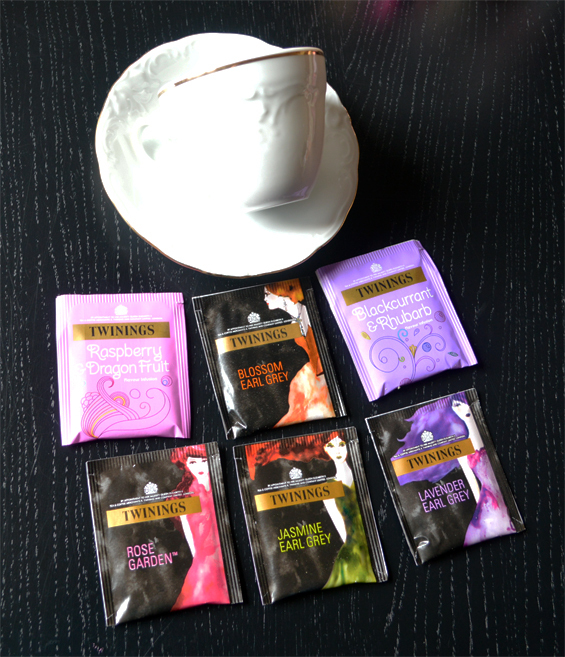 Win a whole bunch of my favourite things! Oh I'm so excited to be holding my first giveaway! I made it my goal this year to really get Sugar, Darling? to the standard I want it to be at and have spent a lot of time and a good bit of money creating the blog you see before you. Over the last few months it has brought me so many lovely opportunities and I've been lucky enough to be given lots of pretty things to review for you guys - the hard work is paying off! Because of this I decided I wanted to thank my readers by holding a little giveaway of some of my absolute favourite things. So let's give you a more detailed look at all the prizes and explain how you can enter to win them all! Clean On Me clarifying shower gel by Soap & Glory which is a truly fabulous and I would never be without! You can read my review of it here. 'She Mist Him' body spray by Along Came Betty - it's sweet and floral and great fir keeping in your handbag in case you need a quick scent top-up throughout the day. Rimmel London Colour Show Off lipstick in the shade 'Love Me'. It's a great metallic pink that will suit most skin tones with a satiny finish and light fruity scent. Bourjois Docteur Glamour lipstick in the shade Orange Charnel which is advertised as an intensive moisturising treatment in a lipstick. The orange shade may seem a little odd to you but its one of my favourites, it's pretty sheer and has tiny specks of metallic glitter that makes your lips sparkle ever so slightly. 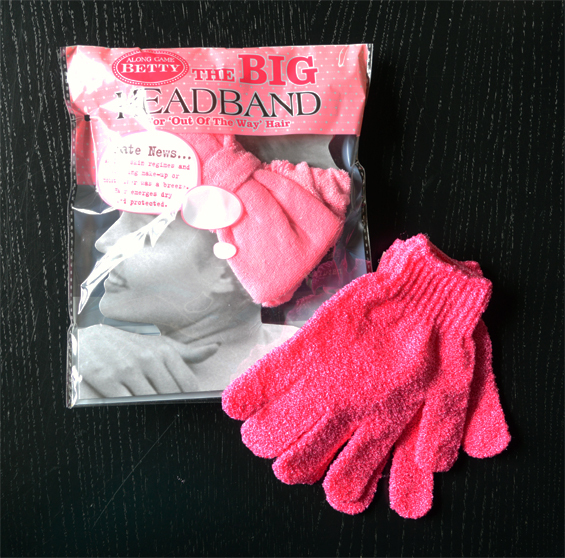 You'll need some exfoliating mitts to go with that shower gel so I'm including a lovely pretty pink pair along with a gorgeously kitschy cute pink flannel headband with a big bow on it! I love headbands like this for when I'm putting make-up on or keeping my hair out of my eyes while I'm painting my nails after a shower. 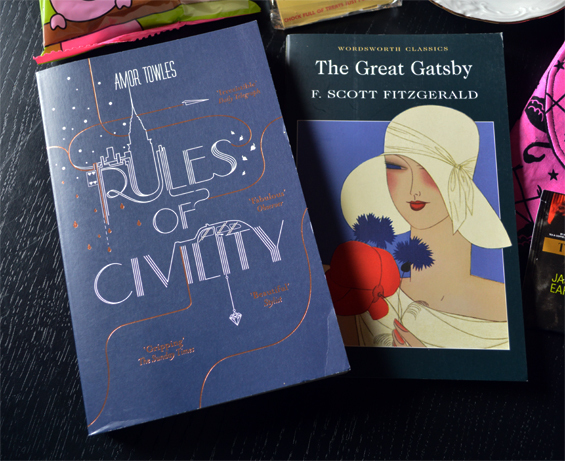 Reading is one of my favourite pastimes so I thought I'd give away brand new copies of two of my most beloved books 'Rules of Civility' by Amor Towles and 'The Great Gatsby' by F. Scott Fitzgerald. They're both set in the same era and are full of wonerful descriptions of decadent parties and outfits and naturally have killer storylines. What could make curling up with a good book better? Some yummy sweet treats! 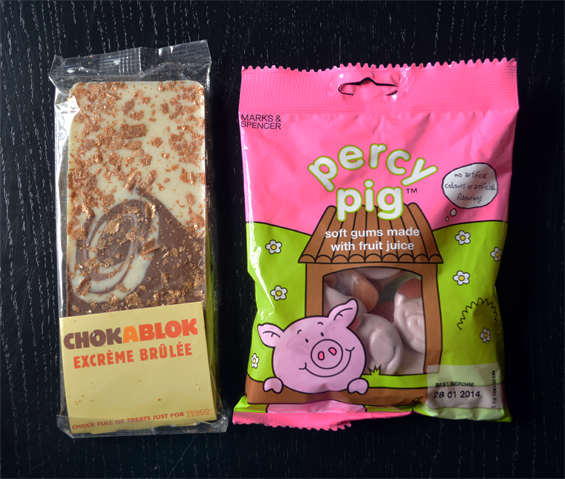 This choccy bar is amazing it's flavoured like a creme brulee and has glittery wafer shards throughout it so it's delicious and beautiful and Percy Pigs are for sure the best gummy sweets out there. And just to make sure your reading sesh is absolutely perfect I'm also giving away a pretty gold edges vintage teacup and saucer and a selection of my favourite flavoured teas! Now for our first donated item which I am very very jealous of! 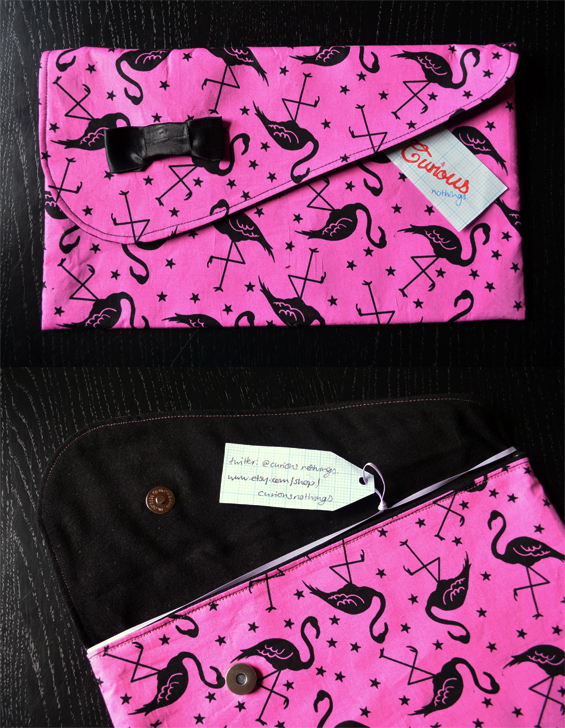 Just look at this stunning flamingo clutch by Curious Nothings! The flamingo print is just darling and it has a super soft black lining with magnetic closure, plus a mega sweet little black bow on the front. I'm definitely going to be ordering one for myself soon as I really don't want to give this away! To have a look at other amazing products from Curious Nothings head to their Etsy shop or follow on Twitter to stay up to date with new items. I particularly love the cherry clutch and the houndstooth cape which is perfect for now the weather is turning chillier! And last but very much not least I have been donated two pairs of tickets by the lovely Vintage Suitcase girls for their Vintage at The Dome Fair and either the Saturday or Sunday of their amazing Very Vintage Christmas Fair. 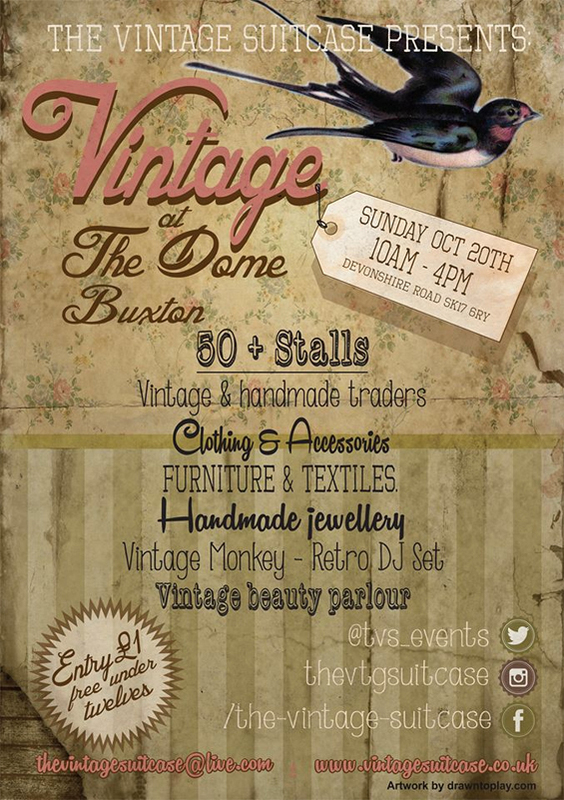 I will be at both events doing vintage inspired hair styling alongside lovely Sassy who is doing make-up so why not head along and get a makeover before you browse all the fab things on sale? 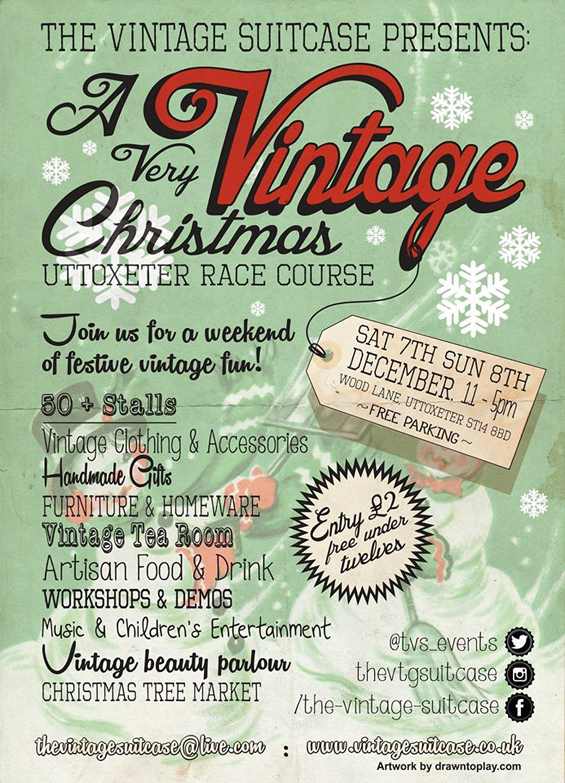 As well as the beauty parlour there will be over 50 stalls selling beautiful vintage and handmade goods as well as a retro DJ set at Buxton Dome and at Uttoxeter there will also be a Christmas tree market, a tea room and food stalls, workshops and demos throughout the day, live music and lots of entertainment for the kiddies so it will be a fabulous full day out! So how do I enter?!?! Leave a comment below telling me which is your favourite prize and why and what you like to do to relax and unwind at home. These are optional and you can do as few or many as you like but make sure to leave a comment for each one that you do! The winner will be drawn on my birthday, October 2nd, using randompicker.com and contacted by email. There is a 24 hour deadline to reply and claim the prize before I draw another name. I will verify the entry and redraw if the reader submits false or excessive entries. If you accidentally submit too many comments or forget to leave your email address just delete and re-submit it! This giveaway is open worldwide but please note if you are outside of the UK you will not receive the Clean On Me shower gel as it exceeds the legal limit for liquids to be posted outside of the UK by Royal Mail. All items were purchased by me with my own money except for the clutch bag and vintage fair tickets which were kindly donated by Curious Nothings and The Vintage Suitcase.